Spontaneously, the Ōtsutsuki clan’s Momoshiki, Kinshiki and Urashiki appears in the tournament arena. 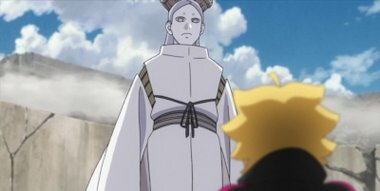 Facing Momoshiki who is after Boruto’s father Naruto, Boruto fires technique after technique at Momoshiki using the scientific ninja tool to no avail, as they are all absorbed by the Rinnegan on Momoshiki’s palm. On the other side, Kazekage Gaara and Mizukage Chōjūrō stands before Mitsuki, who is being targeted by Urashiki.